I don't know if you spend a lot of time over on Instagram, but I have to say, the teacher community there is full of amazing ideas. I am always being inspired to get out of my comfort zone and try something new. 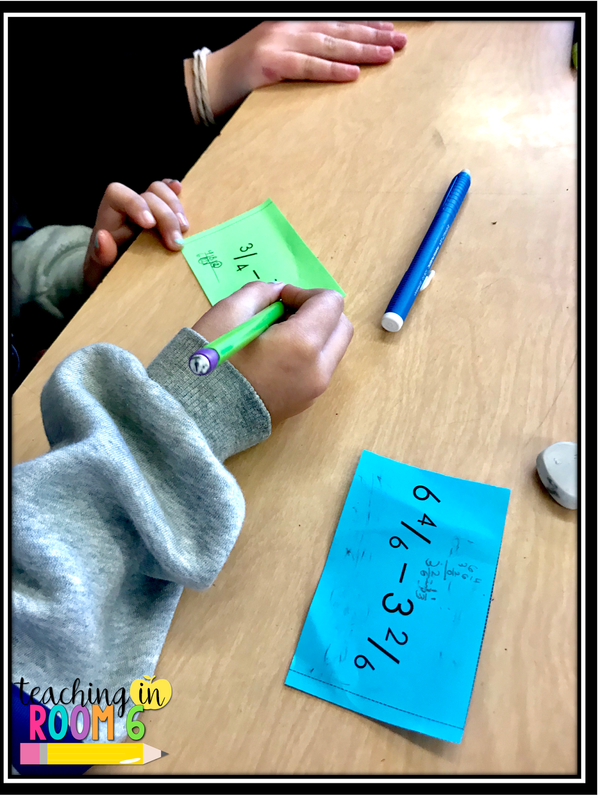 This little review game (though I use that term loosely) was one of those things I saw on IG, tweaked, and used in my room...with much success! So I thought I would share here on my blog with you so that you could replicate as well. 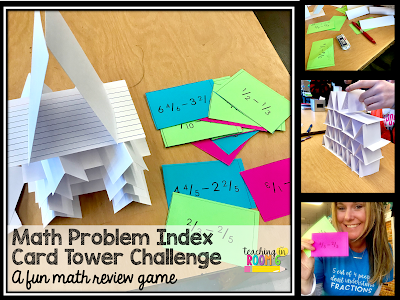 My friend Katie at Adventures of Ms Smith posted about how she had her kids create a tower of index cards using math problems to earn those cards. I thought that was genius! 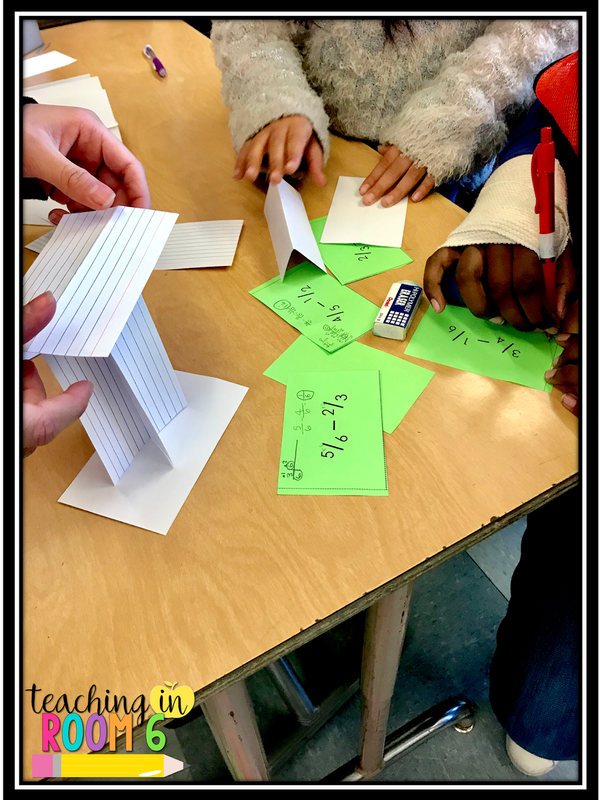 I mean, I had heard of creating tall towers using index cards only, but to have the students EARN each card they used was the perfect twist. So I got to work to see how I could use that idea in my room. We have been working on the various fraction operations, with subtraction specifically our focus for the week. So, using a simple table on PowerPoint, I created 24 "task cards" with subtracting fraction problems on them. There were three levels of problems. The easy ones were straight like denominator problems. Medium level were mixed numbers with like denominators (and no regrouping). The hardest were unlike denominators. Each level problem, once solved, could be redeemed for a certain amount of index cards. Once the kids started correctly solving problems, they then had the index cards on their table. They could work at the building and problem solving at the same time. The kids had to work together on the building as well, as index cards are rather flimsy, so finding the perfect way to stack them proved to be challenging. I did not show them how to bend the cards, or even tell them to do that. Trial and error reigned supreme once the building portion began. Some groups decided it was best to solve all of the problems first, then build with all of the materials at once. Others decided to hold off and see if they could build a tall tower without all the cards available to them. It was a group choice. After about 45 minutes of math solving and tower building, I told them time was up and the tallest tower still standing (as there were MANY falling towers throughout the work time!) was the winner. The kids who won got a pat on the back and the satisfaction of knowing that they built the tallest tower. And that was it. The kids reviewed the math concepts and had a little fun while they were at it. They were engaged and focused the entire math block. What is really great though is that this game can be used for anything. No topic is off limits here and the game rules can still be applied. I foresee us playing this game many more times this year. I saw this on Instagram. Thank you for this post explaining it in depth. Question: Did you give all three level of cards to each group, or did you group them by ability, or did you let them choose and self-differentiate? I gave all three levels of cards to each group, as I wanted them all to be able to do all of these basic skills. There is no reason why it can't be differentiated though. That is a great idea too! 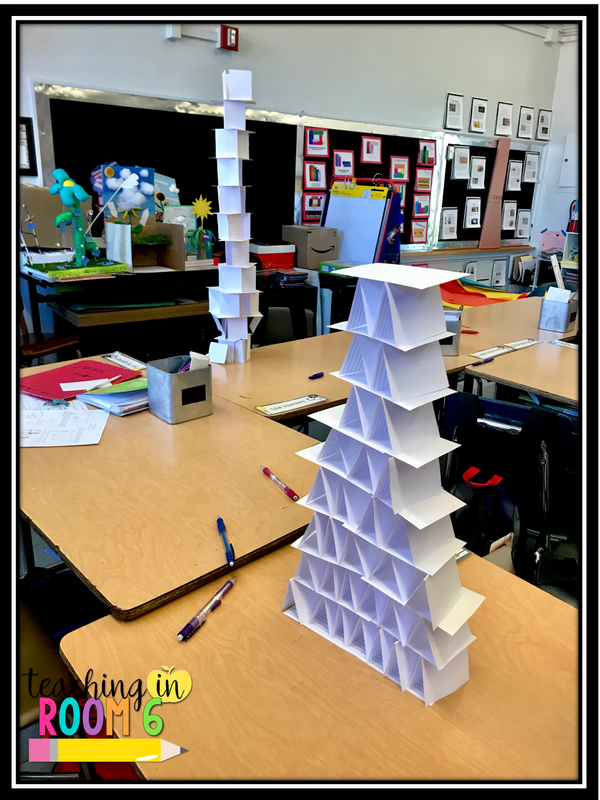 love this math challenge and add a little STEM building to make a fun day of learning and design thinking.